Get ready for a brand new spot to get your chicken tender fix Illinois! 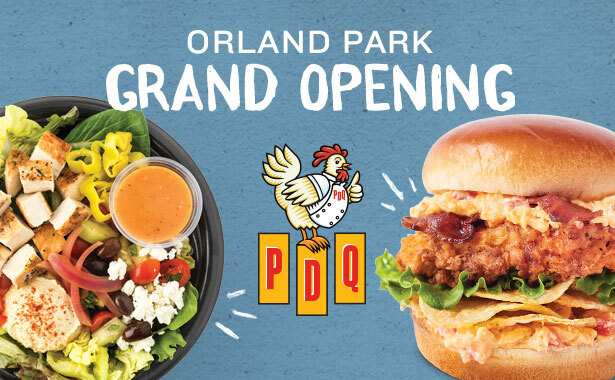 We are excited to announce PDQ Orland Park, our third Midwest location, will be officially opening on Sunday, September 16th. In addition to PDQ classics like hand-breaded chicken tenders, delicious fresh salads, made-to-order sandwiches, unique sides, homemade sauces and dressings made in-house and hand-spun milkshakes, the menu will also feature premium items, including the Pimento Crunch and Grilled Hawaiian chicken sandwiches, bowls like the Thai Peanut and Queso Crunch, and the Yia Yia’s Greek Salad. Perfect for all members of the family, PDQ is open for lunch and dinner seven days a week for dine-in or take-out, as well as via drive-thru or for catering. We will be kickin' the day off with our First 50 lineup. The first 50 guests in line on Opening Day will receive a $50 PDQ Gift Card, lunch on us, and a PDQ swag bag. See below for the official rules and deets. You can check out our newest location to get your chicken fix located at 15646 LaGrange Rd. Stop in and try our delicious new menu items 7 days a week from 10:30 am - 10 pm. As one of our “First 50” Guests in line on Grand Opening Day, Sunday, September 16th, each guest will receive a special PDQ numbered lanyard denoting your place in line. The “First 50” Guests will get $50 in PDQ Gift Cards, a Swag Bag filled with awesome prizes and one Free Combo Meal on Opening Day. The free combo meal can be redeemed for the following items: 3-Piece Tenders Meal (with side and 20 oz. Beverage), 8-Piece Nuggets Meal (with side and 20 oz. Beverage), Sandwich Meal (with side and 20 oz. Beverage), Bowl with 20 oz. beverage OR Salad with 20 oz. Beverage. The lanyards will be distributed by the PDQ Marketing Team upon their arrival on Sunday morning. All guests who receive a lanyard will not be permitted to leave the premises, and will forfeit their spot in line by doing so. Doors open at 10:30 AM sharp. All guests ages 10 and under are welcome to join the lineup with a parent or guardian, but WILL NOT be counted toward the first 50 guests or eligible to receive a lanyard, gift cards or swag bag. One Free Kids Meal (up to $5 value) will be offered to all children 10 and under who arrive with a parent or guardian qualified in the first 50. No Purchase Necessary to participate in First 50 promotion.